Tis the season for the warmest, most comforting of cheeses. Consider Wrångebäck your new best friend for fall’s cold nights. 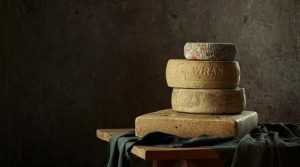 Hailing from a Swedish farm dating back to 1225, Wrångebäck is expertly created by fourth generation cheesemakers. Dense, ultra-creamy, with layer upon layer of browned butter flavor, this raw cows’ milk cheese tastes like sitting in front of a cozy fireplace feels. Perfect for autumn cheese plates, melty soup toppers, or whatever else needs a dose of cozy richness. It’s like browned butter in cheese form.